Kaitlyn loves to imitate mama all the time. When I'm on the computer doing my blog and checking my e-mail she wants to sit on my lap and bang on the keyboard and play with the mouse. Of course i can do what i have to so i had to find another way. We had an old keyboard and an extra mouse in the basement and i took that and put those things on the table in the playroom. 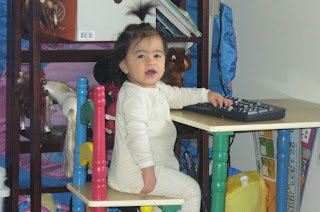 She likes to sit by herself and pretend to be me, and its so funny coz she tries to type and maneuver the mouse as well. She loves following her mama and maybe one day she will be a blogger like mama. hehehe ka cutie oi. alangan sunod jud ni mommy kay mao man permi makit-an ga computer. Paliti nalang na ug computer for kids mommy Lods kay naa man.. with mouse pa.. hehehe.. :) sweet!